Classic Sliding Window is a unique combination of form and function not previously available in the residential category. 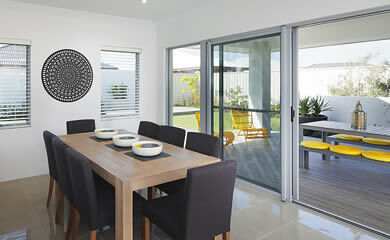 Every aspect of the Carinya Classic Sliding Door has been thoroughly thought-out to create the ultimate sliding door, but at an affordable price. The Double Hung window provides flexible ventilation options with ease of cleaning and is a favourite choice of Australian builders, designers and homeowners. Awning windows are a particularly attractive option when ventilation and unrestricted views are key considerations. The striking lines of the Carinya Classic awning reflect the design and production heritage of all Carinya windows. The subtle, smooth edges and uniform sight lines are Carinya trademarks that add to the architectural look and feel of this evergreen window style that dates back to 1600’s European design. The Carinya Select Hinged Door is a premium product designed for those seeking superior functionality and style as grand entry to their home. The Carinya Select Bi Fold System is a premium product designed for those seeking superior functionality and style in their alfresco area of their home. 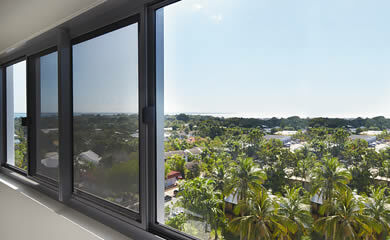 Aluminium windows have been the most popular product used in residential housing in Australia. Builders and architects have appreciated the strength, functionality, durability and large finish options of aluminium windows and doors. Aluminium allows for minimal framing widths, increasing natural light and ventilation, whilst providing unobstructed views of the outside environment. Carinya takes the traditional aluminium window and door concept further by adding modern architectural design and increased performance, suitable for varying budgets and applications. Carinya products have been designed and tested for maximum functionality, styling and durability for today's modern Australian window market. Aluminium is an environmentally sustainable material and has one of the highest recycling rates of any metal. During the recycling process, aluminium only requires five percent of the initial energy used to produce it. 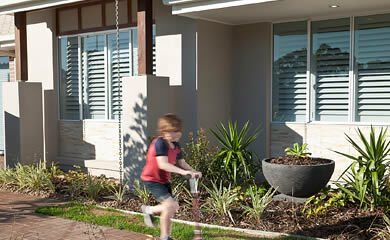 Your choice of window configurations can maximise your view and the aspect of the outside environment. Clever design and a well thought through plan can increase the livability of your internal space, whilst making the most of your surrounds. 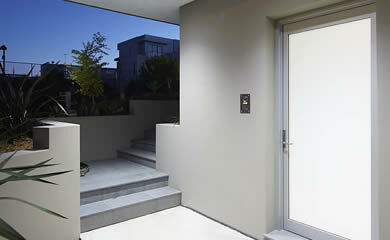 Sliding doors for example are a great way to bring in the view, without using the swing space of a hinged french door. Obscure glass options can be used in areas such as bedrooms and bathrooms, allowing for privacy without reducing the overall light. Modern glass also allows for increase in sound reduction, especially useful for areas close to a source of increased noise, such as an airport or main road. You may consider fixing one sash of a double hung in a child's bedroom, allowing only the upper sash to be operable, giving you piece of mind. Screening options can also provide privacy by reducing vision, whilst Invisi-Gard 316 Stainless Steel Security can be used to protect your home. Your decisions need to take into account other components of your home. For example, a window above a bench may be easier to operate as a sliding window, as opposed to an awning or casement. If an awning window was opening onto a small outside path, maybe a double hung or sliding window is a better option to allow access and reduce the chance of injury. When looking at french doors, take into account furnishings when deciding whether the door should be opening in or out. There are a few other considerations before you select the correct windows and doors for your home. Apart from simply how the product looks, there are other important issues to take into account: location, how the product operates / opens, amount of ventilation required and the increased requirements of energy efficiency and tested products.